Gland, Switzerland – A new report published by WWF and ISEAL today indicates how businesses can contribute strongly to the 2030 Agenda for Sustainable Development and unlock new market opportunities by using credible voluntary sustainability standards to transform entire sectors and supply chains. The report, “SDGs mean business: How credible standards can help companies deliver the 2030 Agenda” illustrates how such standards - ready-made tools for businesses and supply chain actors - can help accelerate progress on many of the Sustainable Development Goals (SDGs) while delivering direct benefits for companies and small-scale producers. Credible, multi-stakeholder standards embody the partnership spirit of the SDGs, bringing together businesses, NGOs, governments and others to work toward common goals that benefit business, people and the planet. They are an important mechanism to help companies reach their targets by scaling-up sustainable practices. Tried and tested on the ground, they can be used at every link in the value chain – enabling producers, harvesters and processors to achieve a recognized level of sustainability, and traders, manufacturers and retailers to address the impacts of their supply chains. Many farmers using sustainability standards have seen net increases in their incomes due to productivity and quality improvements. 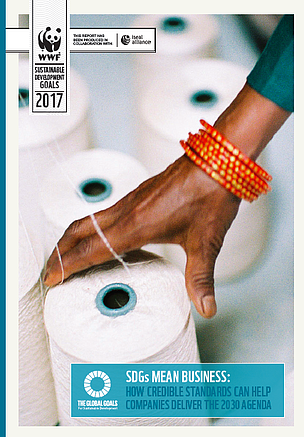 For example, the BCI’s 2014 Harvest Report found farmers following the BCI standard across seven countries had significantly higher yields (ranging from +11 per cent in China and India to more than +50 per cent in Tajikistan and Mozambique) and higher profits per hectare than conventional cotton farmers, while using less water and chemical inputs. For certified coffee farmers, this has translated among other benefits to improved school attendance of their children. In Indonesia, Roundtable on Sustainable Palm Oil (RSPO) smallholder certification is taking pressure off elephants and tigers in Tesso Nilo National Park where French retailer Carrefour has been working with WWF to support smallholders to achieve RSPO certification. Smallholders taking part in the project have managed to increase productivity through better management practices, without expanding into the national park. For businesses certification helps to manage risk. The social and environmental impacts of palm oil production for example represent a significant risk for investors. To mitigate these risks, a number of finance institutions, including the International Finance Corporation, Credit Suisse and Rabobank, require their clients to achieve RSPO certification. Direct benefits for businesses from using sustainability standards can range from efficiency gains through improved management practices, increased transparency and traceability throughout the whole supply chain to better quality relationships between suppliers and buyers. WWF and ISEAL call upon the business community, key implementing partners of the 2030 Agenda, to use credible standards as a tool to increase sustainable practices and report on SDG progress. Sustainability standards translate the broad concept of sustainability into specific, concrete measures for companies and their suppliers. With broad uptake, they can move whole industries toward improved social, environmental and economic performance. This can make a major contribution to the SDGs. Multistakeholder participation: a standard’s requirements should be developed and governed through a multistakeholder process, involving representatives from across the entire supply chain from businesses, civil society, governments, research institutions and NGOs, with balanced decision-making. This should ensure the standard has positive social and environmental impacts, while also being practically and economically viable for large-scale uptake. Transparency: details of the standard, how it is applied and how decisions are made, including certification assessments, should be clear and publicly available. Independent verification: compliance with the standard should be verified by an accredited, independent third party auditor or certification body. Impartial and periodic field-level verification is essential to understand whether a standard is actually achieving its mission. Continuous improvement: the standard and the system should be regularly reviewed to incorporate the latest information and lessons learned and ensure it delivers it goals..
Visit the ISEAL website for a full list of ISEAL members. Alliance, Common Code for the Coffee Community (4C, now the Sustainable Coffee Platform), Better Cotton Initiative (BCI), Cotton made in Africa (CmiA) and Organic. A growing amount of data on farmer livelihoods and productivity is showing how standards can contribute to several targets under SDG2. For example, the BCI’s 2014 Harvest Report found farmers following the BCI standard across seven countries had yields 23 per cent higher and profits per hectare 36 per cent higher than conventional cotton farmers, while using less water and chemical inputs. certification. Smallholders taking part in the project have managed to increase productivity through better management practices, without expanding into the national park. The GoodWeave standard certifies carpets and rugs that are free from child labour or forced labour. The organization runs a vocational training initiative for women, called Weaving Opportunities. Launched in Nepal in 2013, the programme aims to provide at-risk and impoverished women with marketable skills and to replenish the workforce with skilled adult weavers. After three months’ training, participants have the opportunity to work at a GoodWeave-certified carpet factory. In a survey of 87 women on the programme, more than half had no income before the intervention, while those who had been employed had a median monthly income of around US$30. Within the first month of employment, their median income was $60 – and their incomes have risen further as their weaving skills and speed increase.. The social and environmental impacts of palm oil production represent a significant risk for investors. To mitigate these risks, a number of finance institutions, including the International Finance Corporation, Credit Suisse and Rabobank, require their clients to achieve Roundtable on Sustainable Palm Oil (RSPO) certification. Members of the investment community have also formed partnerships to promote more sustainable palm oil production. One such initiative is the Sustainable Palm Oil Investor Working Group, whose 25 members represent assets under management of over US$1.4 trillion. More examples can be found in the report.